A teenage girl only known as “Jane Doe” in a lawsuit against the Plymouth-Canton School system tells 7 Action News the school did nothing to protect her against a follow student who stalked and harassed her for over a year. “It was really rough, it was really a dark place for me,” said Jane Doe. She has asked 7 Action News to remain anonymous. Doe says he life is forever charges because of this male student referred to in the lawsuit as John Roe. PLYMOUTH, Mich. (WXYZ) — A teenage girl only known as Jane Doe in a lawsuit against the Plymouth-Canton School system tells 7 Action News the school did nothing to protect her against a fellow student who stalked and harassed her for over a year. “It was really rough," the teen said. "It was really a dark place for me." She has asked 7 Action News to remain anonymous. She says her life is forever charged because of the male student referred to in the lawsuit as John Roe. “I’m still struggling a lot with normal things, like going to school and going out in the community doing things," she added. "Doing anything really besides leaving my house." She dated him for a few weeks before the start of her freshman year, then they broke up. The lawsuit claims he would wait for her outside her classroom and follow her around campus. At one point he yelled at her in front of others, "I hope you get raped again." While they were dating she confided in him that she had been sexually abused. Things took a turn for the worse after her home was egged over spring break and an inappropriate word was written on the garage door in dog feces. The tires on the car in the driveway had been flattened. After that incident, Doe tried to take her own life. “I sat in a hospital room with her for two days and listened to her hallucinate and scream out why they wouldn’t leave her alone, why she felt she was the things that they called her,” said Jane Doe’s mother. 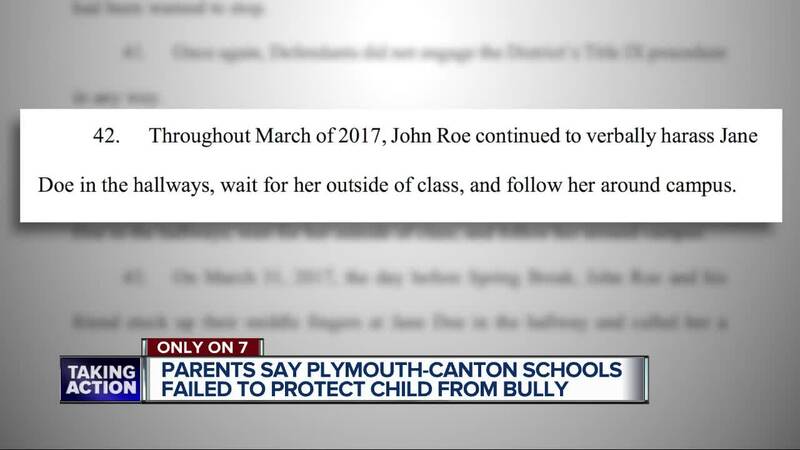 Jane Doe and her mother tell 7 Action News they reported John Roe’s behavior numerous times to the Plymouth-Canton School System, but that no disciplinary action was taken against him. “The district does not tolerate harassment of any kind. all allegations of harassment are taken seriously, are investigated thoroughly, and responded to with appropriate action. We are unable to comment on any specific student matter." Jane Doe left the school system back in September to be home schooled. The lawsuit states she suffers from post traumatic stress disorder because of the harassment. Doe is hoping she will be able to go back to school for her senior year so she can be part of the marching band.